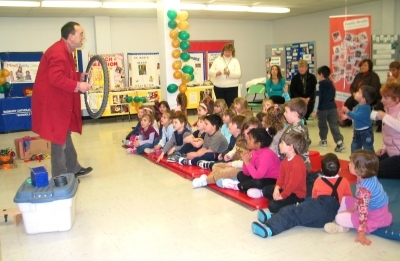 Scientist, Pierre Harrison, owner of PLAYLearnThink, entertains the Junior Kindergarten students at St. Francis Catholic School warming up to the launch of the school’s Best Start Hub. Students were mesmerized by the scientific principles involving disappearing dye in lemons, simulated acupuncture using magnets, and a spinning tray of water that never spilled a drop. February 21, 2008 - Children and families, child care agencies along with community and school staff joined Sudbury Catholic Schools Trustees and Senior Administration and Board staff in celebrating the grand opening of the City of Greater Sudbury’s Best Start Hubs at an Open House held at St. Francis Catholic School on Wednesday. The Best Start Program referred to as “Hubs” is a one-stop centre for families, bringing together kindergarten, childcare, parent-child programs, parenting supports and a wide range of specialized services. The Hubs are located in schools or other locations that are closely linked to schools. Best Start is an initiative of the Provincial Government but is directed at the local level by a Best Start Network which is made up of representatives from the Ministry of Children and Youth Services, the City of Greater Sudbury, all four school boards, and the child care, family support, health and specialized children’s services sectors. The Best Start Hubs incorporate services for families such as kindergarten, childcare and family supports, tot playgrounds, workshops for parents, dad and baby night as well as access to other services. Over time, more services such as selected Preschool Speech and Language and Health Services will be offered in the hubs. The goal of the Best Start Hub is to integrate all of these services so that they are all working together and providing families with seamless services. For more information on Best Start Hubs, please call 311 to find a Best Start near you! � Copyright St. Francis School. All Rights Reserved.